EUGENE, Oregon — A fierce team competition at the final day of the NCAA Division I Outdoor Track & Field Championships came down to Oregon’s women emerging atop a field of tightly bunched podium contenders. 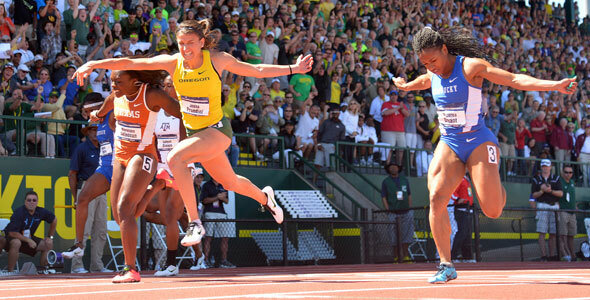 But before Oregon was crowned national champion, the day provided numerous upsets, photo finishes and historic performances. We detail a few of the biggest highlights below. The nineteen open events were won by nineteen different women, and though Florida swept the relays, no one on those squads won an open event. So you had to pay close attention to the podium in every event to figure out the individual star of this meet. It was Oregon’s Jenna Prandini. Asked before the meet about the challenges presented by the new format, Prandini produced a bit of a Zen koan: “You can’t back down from…whatever, so.” And she did not back down. The redshirt junior—Oregon’s championship team graduates only Jillian Weir and Waverly Neer—won a thrilling 100 and produced historically great runner-up marks in the 200 and long jump. If not for Oregon’s disqualification in the 4×100, Prandini would be in sole possession of the third highest scoring meet in NCAA history. As it stands, her twenty-six points this weekend are tied for third most in meet history and are the most since Brianna Glenn scored exactly that many in 2001. Her battles in the 100 and 200 were among the best in collegiate history. She won a scintillating 100 in 10.96 seconds, trailing for most of the race and winning it with her superior top-end speed in the last forty meters. She beat out Texas’s Morolake Akinosun by one one-hundredth of a second for the win; Akinosun’s 10.97 is the fastest runner-up time in meet history. Forty-five minutes later, Prandini got a taste of her own medicine in the 200. Her 22.21 seconds would have been the fastest low altitude, wind-legal time in meet history… except for that Kentucky’s Dezerea Bryant ran 22.18 to set a new meet and collegiate low altitude record. Prandini and Akinosun are used to it. Both were second in those events at this meet a year ago. In all five distance races, defending national champions made huge moves and gapped the field. In four of them, the gamble didn’t pay off. We already covered Wednesday night’s 10000; here’s what happened on Saturday. 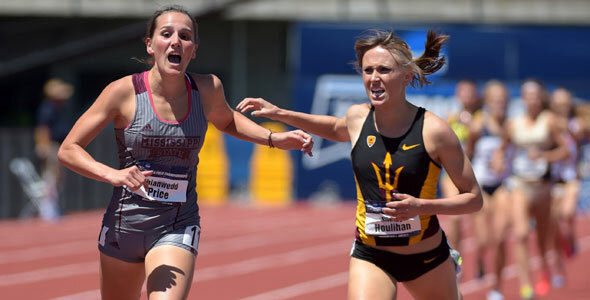 First, in the 1500, 2014 outdoor champ Shelby Houlihan of Arizona State set a blistering pace of 65.5 seconds through 400 meters. That’s meet record pace, and it broke the entire field except for Mississippi State’s Rhianwedd Price. With 100 meters to go, it looked like Houlihan had a gap to Price. But then Price started bobbing her head; she swung wide forty meters out and just edged Houlihan at the line. Price and Houlihan both dipped under 4:10 for the first time in their careers. Price’s 0.11 second margin of victory was the second closest in meet history. In the steeplechase, 2014 outdoor national champ Leah O’Connor of Michigan State was even more dedicated to setting a hard pace, but she had a large group of women covering her every move. Florida State’s Colleen Quigley, UMKC’s Courtney Frerichs, Boise State’s Marisa Howard, and Baylor’s Rachel Johnson stayed in contact through 2200 meters, and with one lap to go, Quigley and Frerichs were still right behind O’Connor. Quigley and O’Connor both struck at the bell lap; their moves tracked each other so closely that they bumped into each other coming around the first curve of the last lap. The race remained an open question through the final water jump. Quigley pushed off of the barrier with much more power and had the race won when her foot landed in the water. The Florida State senior powered away to win by two seconds; her 9:29.32 made her the first non-Colorado woman to break 9:30 as a collegian. Frerichs ran 9:31.36 for a new PB, outkicking O’Connor (9:33.38) for second. Quigley, Frerichs, and O’Connor are the third, fourth, and fifth fastest steeple performers in collegiate history. They already were, but in a different order before the meet. At least Houlihan and O’Connor got to hang on for top-three finishes. 2013 outdoor 800 meter national champ and 2015 indoor titlist Natoya Goule of Clemson set such a brutal pace that she ended up outside of the top five. She covered her first 400 meters in 56.17 seconds, nearly two full seconds clear of the entire field. The women behind Goule wisely laid off the pace, including Oregon’s Raevyn Rogers. The true freshman began closing in on Goule with 250 meters to go and passed her around the curve; she blasted home in the field 100 meters nearly a full second ahead of second and became only the fourth woman to break two minutes during the collegiate season. 1:59.71 is the No. 4 time in meet history and Rogers is the first freshman to win the event since Oregon’s Rebekah Noble did so in 2006. Rogers is also third all-time on the American junior list, trailing only Ajee Wilson and Mary Cain. In the last distance event of the year, and the last race ever for Emily Sisson in a Providence uniform, some order was restored. Sisson led the 5k from the gun and looked fresher in the last two laps than she did at the beginning of the race. Her 15:34.10 time was unspectacular, but she was the only woman in the NCAA who managed to set a tough pace and hold on for the win. Here’s how impressive Shamier Little’s 53.74 400 hurdles time is. If you multiply that time by four, you get 3:34 and change—a time that would have beaten Texas in the 4×400 and would have been very close to Texas A&M and Arkansas’s relays as well. 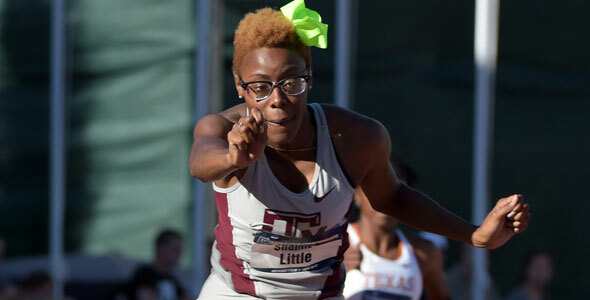 The Texas A&M sophomore ran a world leader, school record, and the No. 4 time in collegiate and meet history. Kentucky’s Kendra Harrison led the race through 300 meters; her finishing time of 54.09 is No. 5 in college and meet history. For the second straight year, Little and Harrison went 1-2. 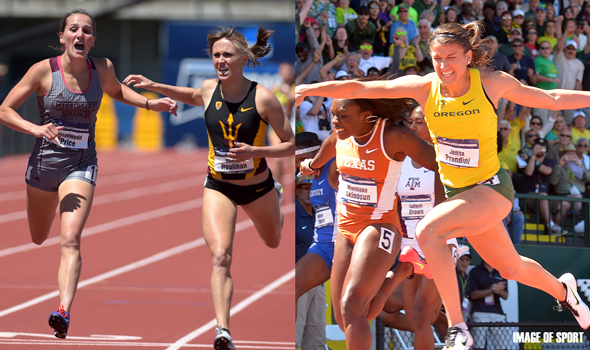 The last ten NCAA meets had produced nine different champions, and none in consecutive years. Little is the first back to back winner since UCLA’s Sheena Johnson did so in 2003 and 2004. And she’s only a sophomore. Per TFRRS, Little—the world junior champ—has only lost one 400 hurdles final in her collegiate career.